As part of the Storytelling Certification, i’m asking people to curate a piece of graffiti, and analyse it. And i realised i wanted to have a go at this myself, so today i’m sharing a piece i found in New York, and just reflecting on what it means: both how it finds it’s meaning, and the story that it may be telling. I found this graffiti, sprayed on the side of a bar, on the east side of Manhattan, so the context and story are presumably related. Indeed, i suspect it’s ‘sanctioned’ graffiti, urban art, or street art, to add informal context to the venue. The story is clearly about performance: a DJ with decks, multiple imagery giving a splintered sense of elapsed time. The arms working the decks show different tattoos: maybe that represents different people, perhaps the avatar is an amalgam, or abstraction, but in any event, tattoos represent identity, belonging, and possibly an outsider persona. On the right, stencilled on the back of the deck, it says ‘WF CRW’, maybe WF Crew? Again, perhaps a group identity? The avatar wears a T shirt with skull and crossbones on it, again, an outsider sign, as well as baseball cap, itself a sartorial counterpoint to a suit, or formal piece of millinery art. The baseball cap again indicates movement, facing two ways at once, and the identical artwork on each face indicates it’s the same hat in motion: the pink and blue tag may represent identity, certainly that stylised font is archetypal for more refined tags. 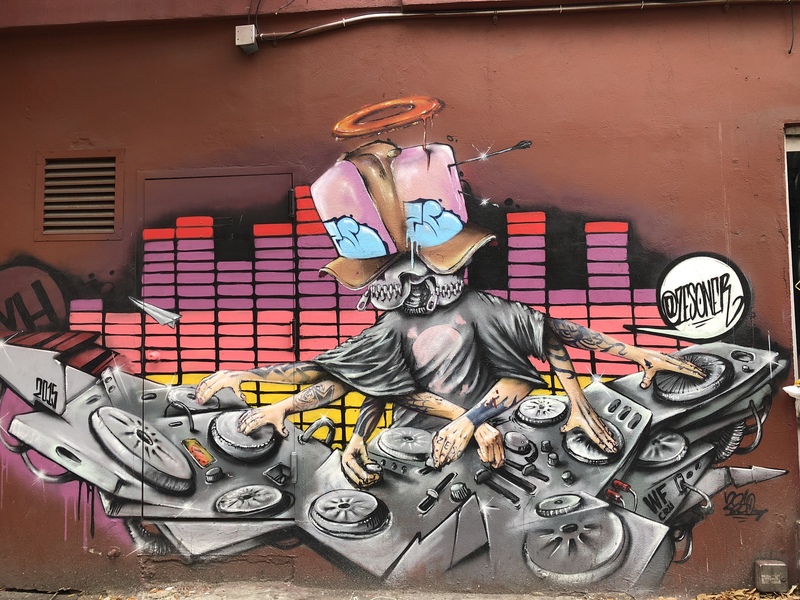 Tags are highly territorial, and typically the entry point to the graffiti community, so in itself, understanding this may position the artists as fully fluent in the taxonomy, and identity, of graffiti, not simply someone appropriating the imagery. Beneath the had, the skull, possibly metallic, is a typical signifier of counter culture, or raw authenticity, popularised by the Guns ‘n’ Roses skull cross, so maybe an attempt to credential the DJ. The zip for a mouth is interesting: both have teeth, but this one seems zipped shut, which could represent a dichotomy: is the music the outlet when words are forbidden? In London right now, certain drill musicians are forbidden, by court order, from using certain words or phrases, a significant imposition on civil liberty. Perhaps we can censor words, but not art: there is a proud history of using art to signify reality, whilst avoiding the consequences of direct representation. The cap on the right is pierced by an arrow, although why is unclear: is it a crossbow bolt, a significant symbolism of illegal weaponry, or a tranquilliser dart, which may indicate an attempt to silence? Does the inclusion on the right, not the left, again indicate the passage of time: the music starts on the left, and tracks to the right, with the arrow hitting in the meantime? The red halo is an appropriated symbol: the sign of the saint, but this figure looks decidedly un-saintly. Does the halo mean that ‘perfection’ is claimed in this case? Is it an additional sign to indicate authenticity, or validity of the form? Behind the avatar is something familiar to any of us growing up in the 80’s: the graphic equaliser. The cheaper your stereo, the more LEDs involved in this. The prevalence of ‘red’ bars indicates volume, high levels of noise, pushing a boundary. This is not safe music: many aspects of the image indicate it’s dangerous: the skulls, the indication of movement, the gang indicators, the arrow. This is music as counter authority, as rebellion. The paper plane, harder to explain: somewhat childlike, does it mean the message taking flight, or an irreverent response to something? A very contemporary inclusion is the @ twitter identifier, which speaks to the nature of graffiti art in a community context. Whilst this piece may tell it’s own story, the handle links it to the portfolio of the artist, and this is itself a core indicator of the evolved power dynamics of the Social Age. Graffiti, historically, was transient: spray today, tagged or obliterated tomorrow. But today the permanence sits with a community who are aggregated by hashtags. There is a permanence of imagery and, hence, the emergence of a broad reputation economy, with a persistency of value. Graffiti represents a claimed voice, and an often irreverent, or counter cultural voice. Whilst much of my interpretation may be wrong, to better understand the power of claimed voices, and non verbal storytelling, we can find value in exploring it in more detail. This entry was posted in Graffiti and tagged Graffiti, Story, storytelling. Bookmark the permalink.